Day 11 Japanese and really awesome video quality, thanks to Mbovo. Never dreamed we would ever get to see this quality of videos. The caption on this (and the English version) both say this is Day 9 video, but they are obviously Day 10 videos (the title here and on YT (and YT comments) all say so). Don't be confused, fellow viewers! Yes, I guess doing two videos a day is a bit overwhelming. I will go back to doing only English for now.. Yes, I guess doing two videos a day is a bit overwhelming. I will go back to doing only English for now. You must be tired as you're taking it entirely the wrong way. I watch from here and was slightly confused at the mismatches. As you'd noted it on YT but not here I noted it here. That's all. As for 2 different language versions, I have been pleasantly surprised you've taken the time, and stunned you've done both every day so far. That's a lot of additional work on top of everything else you voluntarily do around here. Greatly appreciated. No, I'm making too many errors lately and I just get annoyed with myself. 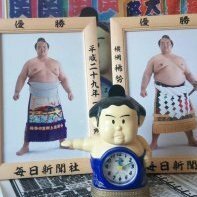 I'll probably do both till the end of the basho, as stopping now would be like Hakuhou pulling out of the basho on day 12 after going 12-0.. Thanks for the heads up anyhow. I shall gambarize, although I am very tired.. These guys are still around. Senshuraku- Final Day- Japanese-special thanks to Mbovo-you all know why.. Thanks for your dedicated efforts to bring us your video digests of all the sumo tournament action yet again this month. btw, love the still of you with a young Hoshoryu's uncle! Just an observation: was Tamawashi really the "Cup holder" when he lost to Shodai on senshuraku? I believe he had to give the Emperor's Cup back before the tournament even started... And in my opinion, Tamawashi sure didn't look like a former "Cup holder" in this tournament! He is like the cup holder in my car. Comes in handy from time to time but REALLY useful once in a lifetime.